Perfect “on-the-go” sandwich for quick lunches or picnics. 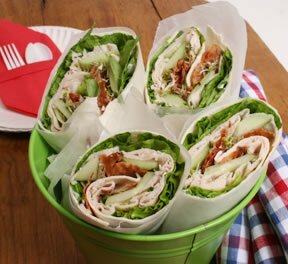 These wraps are great for packing in school lunches and the kids love them. The kids enjoy having a change from a traditional sandwich and mom will feel good about sending a healthy lunch the kids are sure to eat. See how easy it is to make a tasty muffin that the kids will love to have in their lunch box or as an after school treat. Simple steps on how to cut a watermelon and remove the seeds for a perfect lunch box or after school snack.